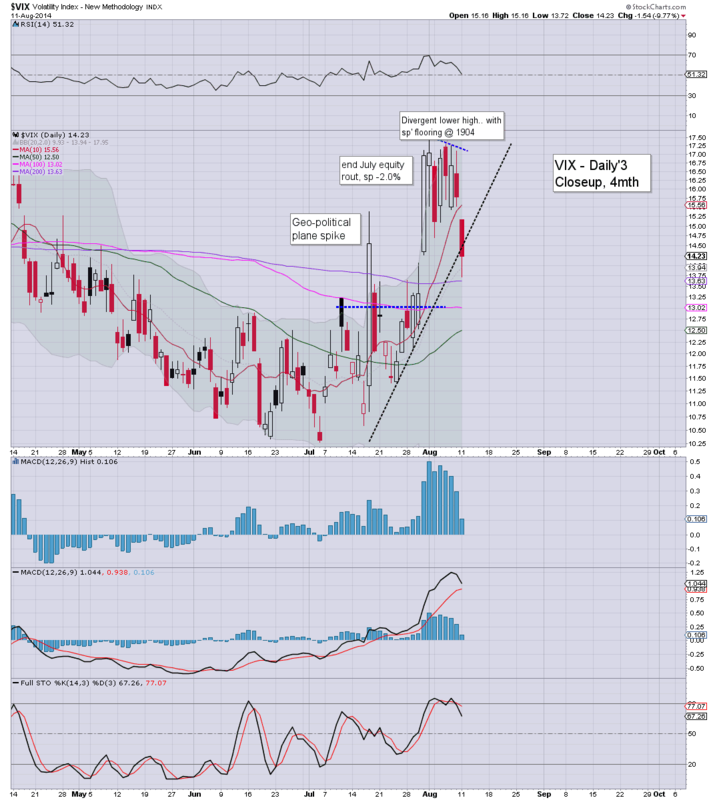 With US equities climbing for a second day, the VIX was naturally lower, settling -9.8% @ 14.23 (intra low 13.72). 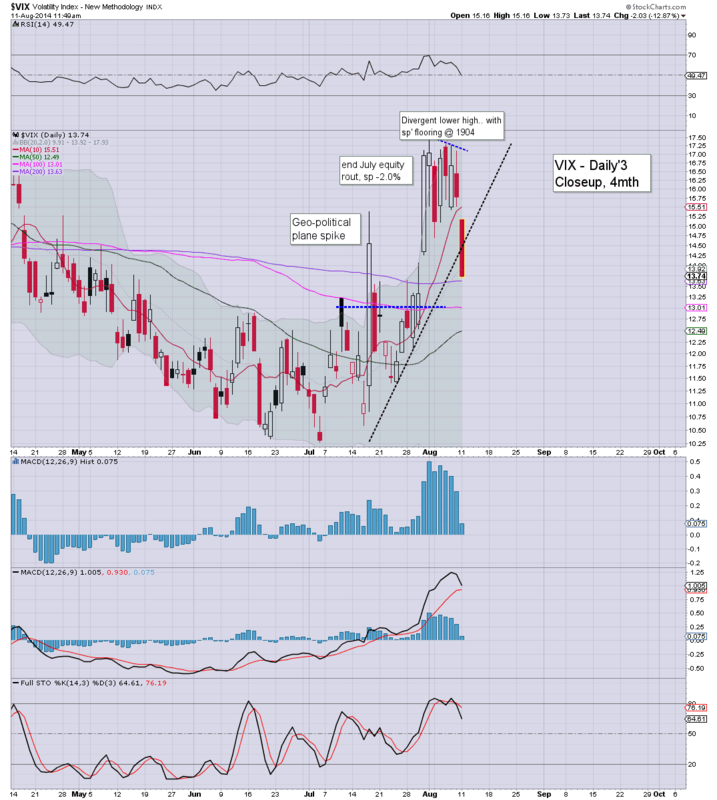 Near term outlook is for VIX 12/11s. The 10s look difficult, unless sp' can break back into the 1970s... which won't be easy. *notable VIX gap filled in the low 14s. VIX failed to break above the 17.50s last week...the divergence played out..and we're likely to see the VIX remain subdued for much of the week. Certainly, a break into the 18s looks very unlikely... barring a 'spooky' news story from the Ukraine. Equities closed higher for the second consecutive day, sp +5pts @ 1936 (intra high 1944). The two leaders - Trans/R2K, settled higher by a borderline significant 0.8% and 0.9% respectively. 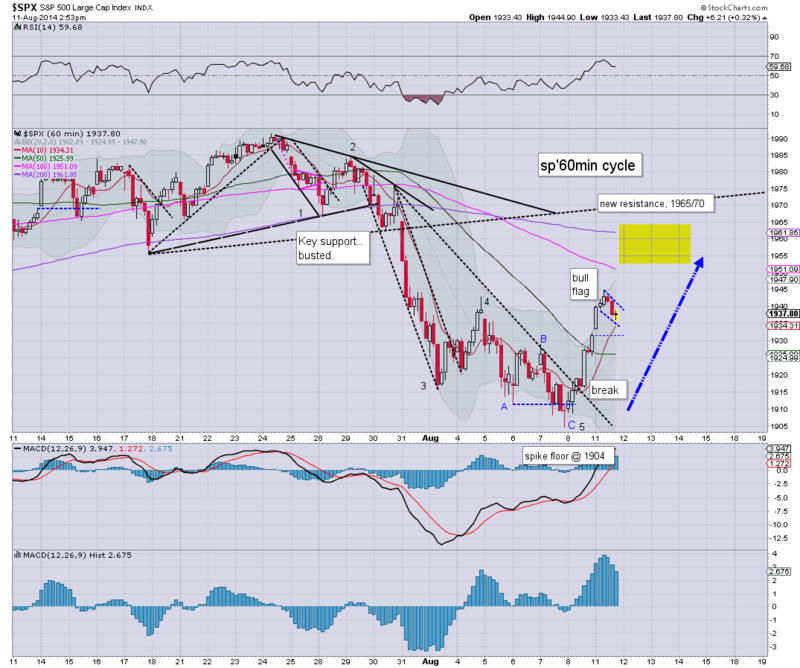 Near term outlook is for the sp'1950/60s. Despite the indexes cooling down in the late afternoon, price structure is a rather clear bull flag, market looks set for higher levels across the next few days. *I hold long overnight from sp'1937, seeking an exit in the 1950/55 zone.. tomorrow or Wednesday. more later... on the crushed VIX. US equities are set to close higher for the second consecutive day, and the Thurs/Friday overnight lows (equiv' to sp'1892) are now looking a fair way down. VIX is set to close significantly lower, back in the 13s. *I am LONG from sp'1937... seeking an exit in the 1950/55 zone.. tomorrow or Wednesday. 3.09pm.. a close in the 1940s would provisionally confirm the bull flag.. and offer the 1950s by late tomorrow morning. Considering we're only into the 1930s... I can't see much of a retrace from here...the 1950/55 zone looks a reasonable target. *I will hold long overnight. US indexes are holding the gains. Price structure on the smaller 60/15min cycles is a very probable baby bull flag, offering an attempt at the 50 day (sp'1955) tomorrow. Metals remain weak, Gold -$3. Suffice to say... smaller 5/15min cycles have arguably already seen a down cycle - at least in time... whilst prices have held. Typical afternoon flooring time would be around 2.30pm...so.. lets see if bears can knock it down to around 1935. 2.05pm.. standing by to pick up another SPY call block... around 1935/00 zone. 2.07pm.. LONG, sp'500 from 1937.. .seeking 1950/55 tomorrow. *I will hold long overnight... seeking the 1950s tomorrow..or Wednesday... I don't mind either way. US equities are very resilient so far today, with sp' holding gains of 0.5% in the low 1940s. First upside target remains the 50 day MA of 1955. Metals remain weak, Gold -$4. VIX is getting crushed, -12% in the 13.80s. *a brief look at the giant monthly cycle. Most notable.. upper bollinger.. 2040s.. which would be a prime target by late September. I realise that probably feels a long way up.. but we're only talking about 5% across 5-7 weeks. Very viable. Something that I am also noting.. the lower Keltner...currently around 1600. By late autumn, that will be in the upper 1600s. Certainly..it will be difficult to break into the 1500s.. no matter how 'spooky' geo-politics might get later this year. Whilst the headline sp/dow indexes see moderate gains, there are notable significant gains in the Trans/R2K, both higher by around 1.4%. VIX is getting crushed as geo-pol concerns melt away, -12% in the 13s. 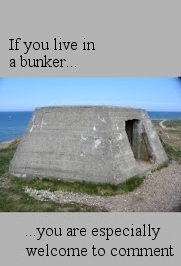 *I exited an index-long at 1941... I won't complain if we keep clawing..to the 1950/60s. Not much to add right now. We're seeing some significant follow through from last Friday. VIX is certainly confirming the move...and with the Trans/R2K both significantly higher, there is little reason to believe sp'1904 will be broken for some weeks..maybe not until late October. Indeed, few want to go long the VIX today. 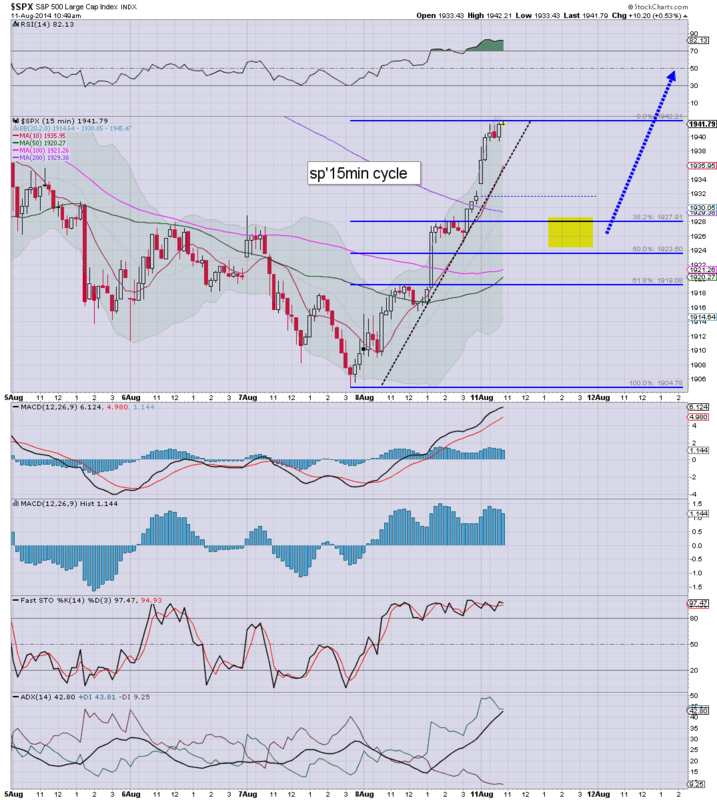 Its very possible we'll be back in the 11/10s, certainly if sp'1970s. 12.23pm marginal break of short term up trend... still viable 1920s late today/early Tuesday.. before resuming higher. I'll be a buyer if <sp'1930. US equities have built moderate gains, but there is high likelihood for a down wave into the afternoon.. even with most indexes turning slightly red. Regardless, bears are generally weak.. and primary upside target is the 50 day MA in the mid 1950s. *I intentionally got stopped out at sp'1941.. am content with that...considering in at 1912 last Wed'. So... its typical turn time....lets see what the bears can manage by 2pm or so. Best case downside is probably 1928/26....at which point I'd be a buyer. 11.14am... R2K +1.3%... certainly...showing no sign of weakness. The 1160/65 zone is viable by Wed/Thursday. 11.21am.. R2K +1.5%.. .starting to be a powerful day. Market in melt mode...next level .. sp'1955.. the 50 day MA. 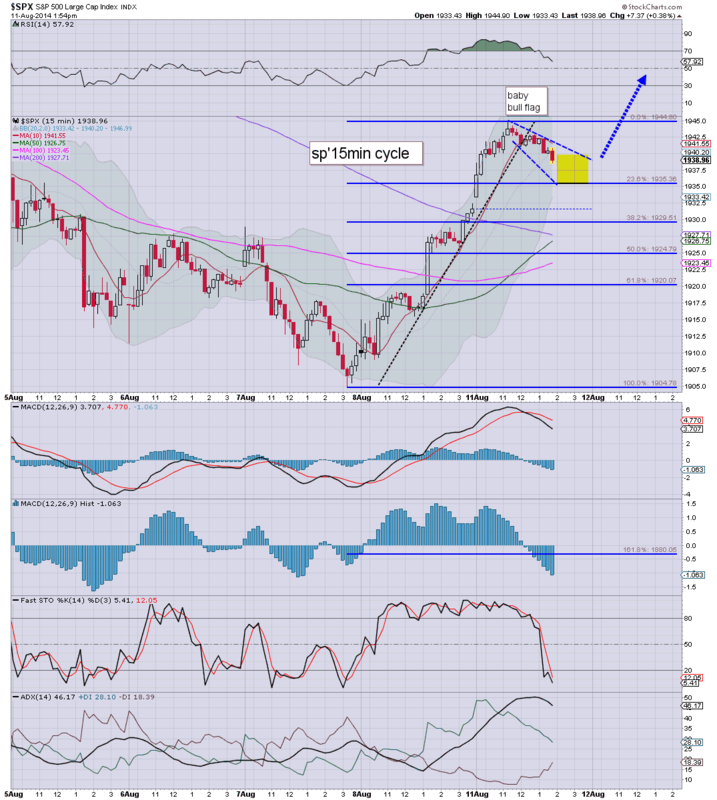 *notable blue candle to start the week.. on the weekly cycle. So..we're higher, and right now..there appears zero downside pressure. 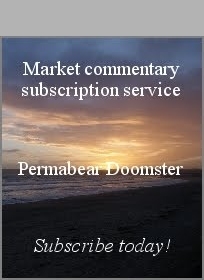 Of course, market remains highly susceptible to sporadic news headlines. 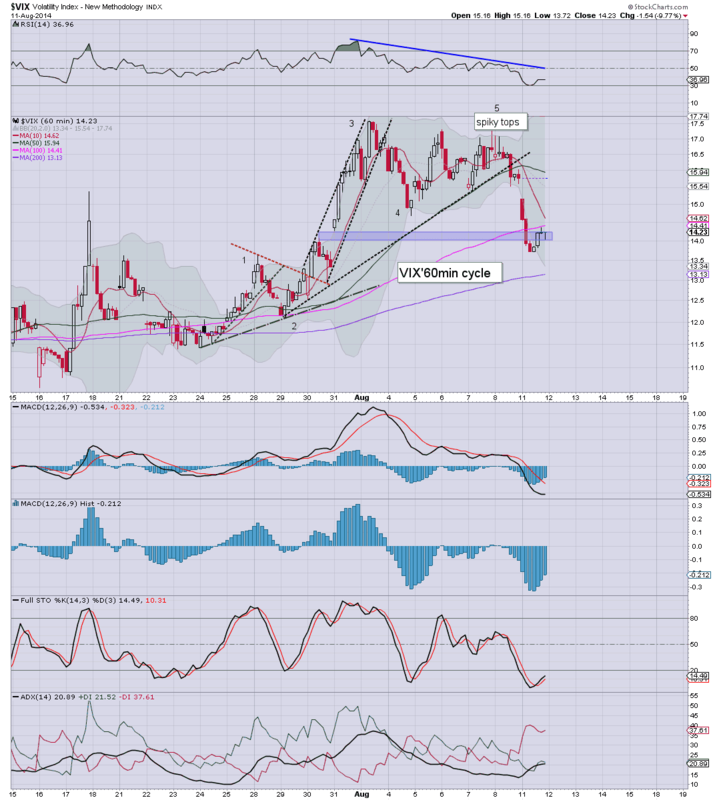 VIX is weak, -5%... set for the low 14s. 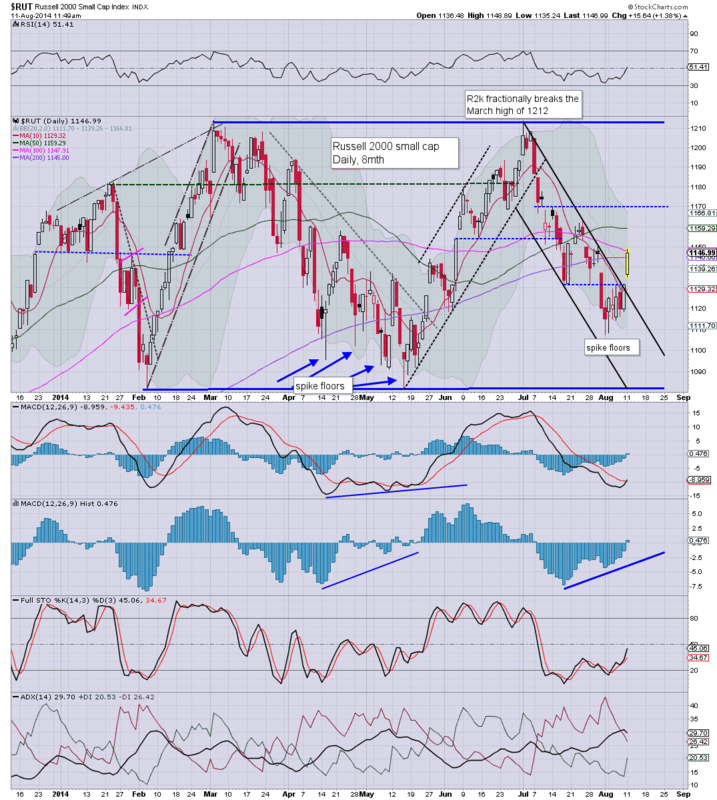 R2K has decisively broken the down trend..set for the 1160s. 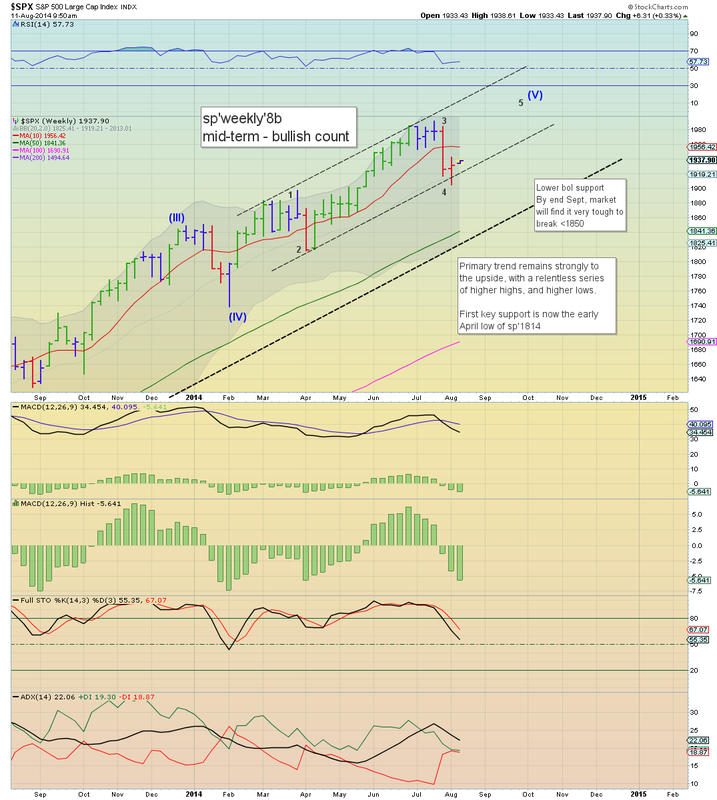 10.05am.. a long week ahead, but the weekly MACD cycle on the 'usually weaker' R2K is starting to tick upward... first time since the secondary peak in early July. 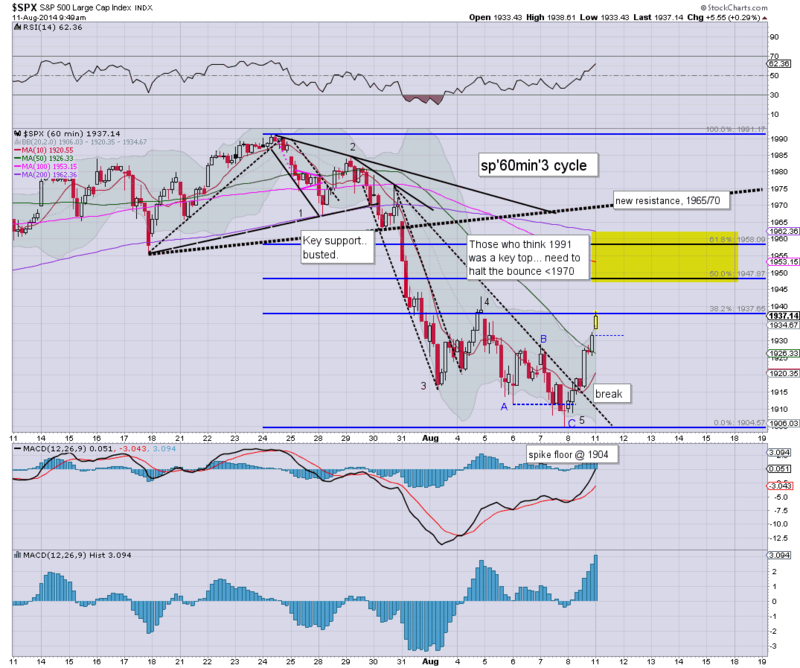 Bodes for 'general' upside into mid/late September. Lets see how far we cycle down into the early afternoon. 10.30am... very viable for indexes to turn moderately red this afternoon. 1928/26.. maybe. I would go long..if so. 10.38am.. typical turn time of 11am coming up.....equity bulls still stuck around 1941. Good morning. Futures are moderately higher, sp +6pts, we're set to open at 1937. Metals are a touch weak, Gold -$1, whilst Oil is +0.3%. 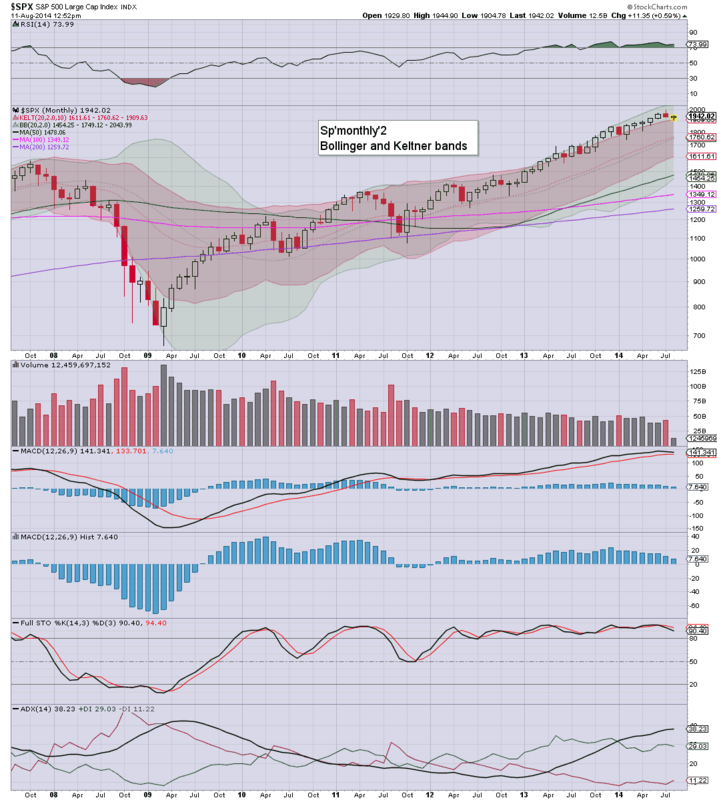 Equity bulls look set for at least another few days of gains, to the 1960s. 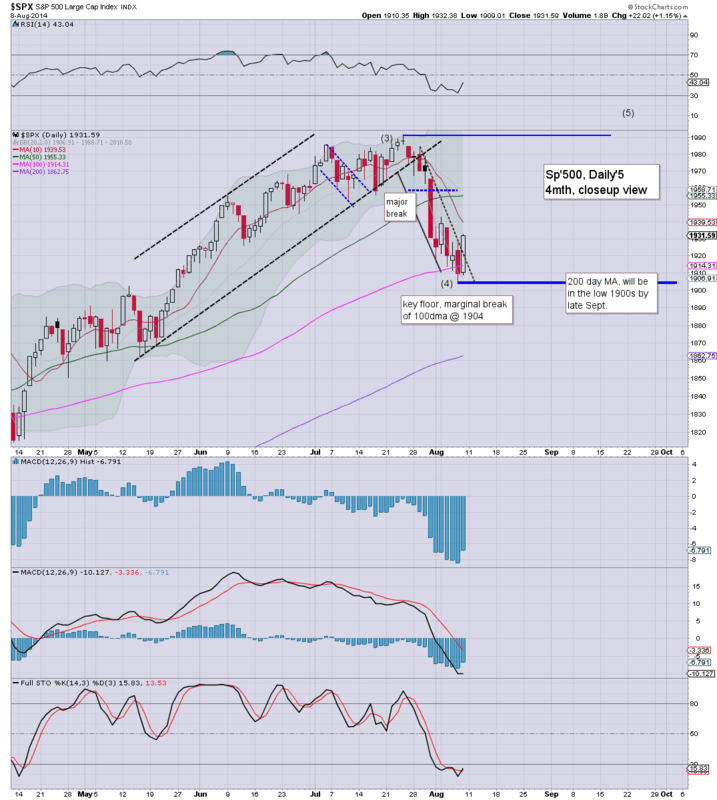 First upside target for the equity bulls should the 50 day MA in the sp'1950s. There will likely be strong resistance in the 1960s. 1970s remain key.. any daily closes there.. and it will be highly suggestive that the low 2000s will be hit in September.. completing the giant wave from Oct'2011. *I am currently long, but will look for an exit in the 1950/60s within the next few days. Personally, I think PCR needs to take a few happy pills. He is one of the regular 'macro doomers' who has been doing the alternative media circuit for some years. Same old spiel every time... essentially, the 'we're all gonna die!' mantra. As ever.. make of it....what you will. Regardless of that nonsense..... good wishes for the trading week ahead! 9.35am.. R2K decisively breaks the down trend from 6 weeks ago..